L Kane. Urban Transport Research Group. University of Cape Town. the urban design mix must surely be beneficial? poor or worsening transport conditions. is for roads which mainly access property, and which do not perform a mobility function. along urban arterials which host many functions. assumptions do not hold true should be questioned). varying international contexts, and the peculiar characteristics of South African cities. (National Department of Housing) (2000) Guidelines for Human Settlement Planning and Design. 2.6m in the US, 2.5m in The Netherlands and 2.6m in South Africa. 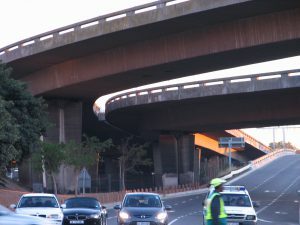 South African arterials tends more towards 80km/h than the legal limit of 60km/h. is removed into turning lanes, preferably in a median. urban road narrowing, and the improved pedestrian safety offered by narrower crossings. speed and injuries in narrowed residential streets. far more common in urban areas) must be an open discussion of the roles of the road. were highlighted, described and answered. Source: Kenworthy, J. Eppendorf , Hamburg. A main road reduced from 4 lanes to 2.
users can debate the role and purpose of urban arterial roads: for access, mobility or…?